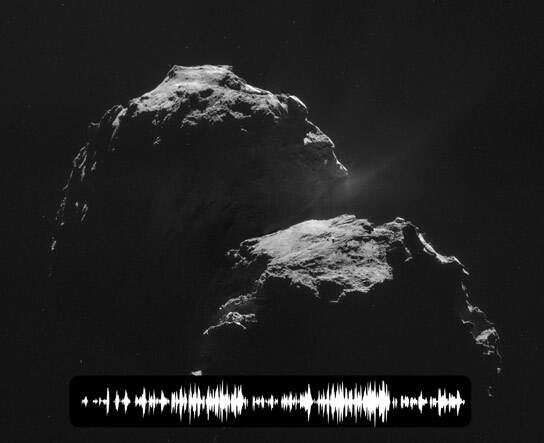 As ESA’s Rosetta spacecraft prepares to dispatch its Philae lander to the surface of Comet 67P/Churyumov-Gerasimenko, a set of instruments on Rosetta has picked up a mysterious “song” from the comet. The sounds are thought to be oscillations in the magnetic field around the comet. They were picked up by the Rosetta Plasma Consortium — a suite of five instruments on the spacecraft that is orbiting the comet. The comet’s song would not be audible to the human ear because it is being emitted at 40 to 50 millihertz, far below the range of human hearing, which typically picks up sound between 20 hertz and 20 kilohertz. To make the sounds audible to humans, Rosetta scientists have increased the frequencies by 10,000 times. The Rosetta’s Rosetta Plasma Consortium consists of five instruments on the Rosetta orbiter that provide a wide variety of complementary information about the plasma environment surrounding Comet 67P/C-G. Plasma is the fourth state of matter — an electrically conductive gas that can carry magnetic fields and electrical currents. The consortium instruments are designed to study a number of phenomena, including the interaction of 67P/C-G with the solar wind, a continuous stream of plasma emitted by the sun; changes of activity on the comet; the structure and dynamics of the comet’s tenuous plasma atmosphere, known as the coma; and the physical properties of the comet’s nucleus and surface. The comet sounds were heard clearly by Rosetta’s magnetometer experiment for the first time in August, when Rosetta drew to within 62 miles (100 kilometers) of 67P/C-G. Scientists think the sounds must be produced by the comet’s activity, perhaps as it releases neutral particles into space where they become electrically charged, or ionized. The precise physical mechanism behind the oscillations remains a mystery. “This is exciting because it is completely new to us. We did not expect this and we are still working to understand the physics of what is happening,” said Karl-Heinz Glassmeier, head of Space Physics and Space Sensorics at the Technical University of Braunschweig, Germany. Rosetta is a European Space Agency mission with contributions from its member states and NASA. Rosetta’s Philae lander is provided by a consortium led by the German Aerospace Center, Cologne; Max Planck Institute for Solar System Research, Gottingen; National Center of Space Studies of France (CNES), Paris; and the Italian Space Agency, Rome. NASA’s Jet Propulsion Laboratory in Pasadena, California, a division of the California Institute of Technology, manages the U.S. participation in the Rosetta mission for NASA’s Science Mission Directorate in Washington. 1 Comment on "Rosetta Spacecraft Picks Up a Mysterious “Song” from Comet 67P"